Chairman of International Forum for Justice and Human Rights group in the Valley, Mohammad Ashan Untoo, along with the “Human shield” victim Farooq Ahmed Dar of Budgam on Thursday held a protest demonstration in press colony, demanded an action against Major Leetul Gogoi. 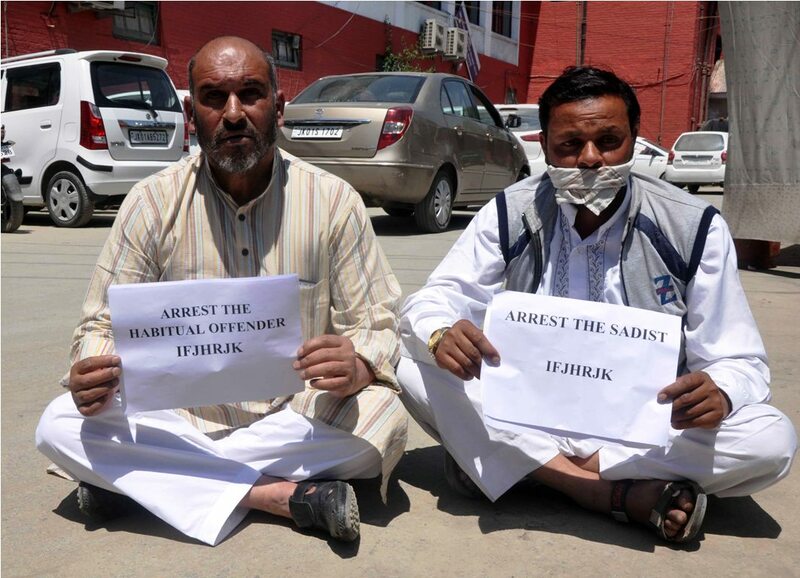 Mohammad Ahsan Untoo along with Farooq Dar while holding placards which read, “ Arrest the habitual offender,” “Arrest the sadist,” during a sit demonstration in press colony demanded an action against the accused. On May 23, Gogoi was held with a girl and a civilian driver Sameer Ahmed Malla, both from Budgam, in Srinagar hotel. He was soon detained by Police station Khanyar Srinagar, following his altercation with the staff of a local hotel he had booked. Gogoi had booked a room online in Grand Mamta Hotel, Buchwara Dalgate, in the name of Leetul Gogoi, a resident of Assam. An embroidery artisan till a year ago, Farooq Dar was tied on an army jeep as a “Human shield” on April 9, 2017, by a team led by Major Leetul Gogoi tied Dar to escape stone throwing in central Kashmir’s Budgam district. The video of the incident later made headlines all over the country.